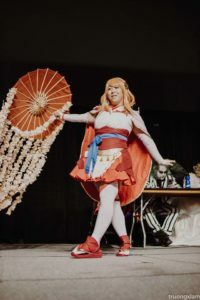 The Grand Rapids Comic-Con has created the Sidekick Lounge, a space at the event for cosplayers to get a rest from the crowds, take a break from photographers, and to have costumes repaired and make-up refreshed. As the show has developed into the large regional event it has become, we have seen more of a need for a place for cosplayers to congregate and recharge their batteries, hence the creation of Sidekick Lounge. Sidekick Lounge will have some tables and chairs for cosplayers to relax from the crowds a bit and eat meals in relative peace. We will not have any food available in Sidekick Lounge, but cosplayers are welcome to bring their meals up there. Sidekick Lounge will have a station dedicated for cosplayers to refresh their make-up. There will also be a couple changing stations so that cosplayers can adjust more intimate aspects of their costumes or even change outfits in private. If you are having a cosplay malfunction at the Grand Rapids Comic-Con then Sidekick Lounge can help. Sidekick Lounge will have a full repair station including a sewing machine, hot glue gun, and soldering iron for use free of charge. There will also be a wide variety of thread, buttons, zippers, and other repair supplies available for use. There will also be a couple robes for people who may need to remove their costumes for repair so they can keep their modesty. No photography in Sidekick Lounge: There are people in there taking a break from the photographers, so give them respect. Sidekick Lounge is not a place to store your stuff, extra costumes, etc. : We are not responsible for anything left in Sidekick Lounge and items left overnight will be properly removed nightly. 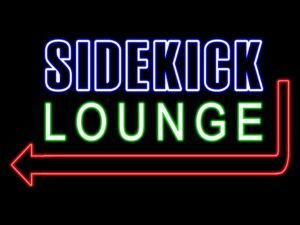 Sidekick Lounge is not a place for solicitation: There will be no buying or selling of equipment, costumes, photo opportunities, etc. in Sidekick Lounge. Cosplayers are welcome to exchange business cards and network, but no direct sales at event please.